EU calls on Gaza's Hamas terrorist rulers to stop executing those found guilty of collaborating with Israel. The EU mission in Jerusalem and Ramallah on Sunday condemned the recent execution of two Palestinian Authority Arabs in Gaza by Hamas authorities, a statement quoted by the Ma’an news agency read. "The de facto authorities in Gaza should refrain from carrying out any executions of prisoners and comply with the de facto moratorium on executions put in place by the Palestinian Authority, pending abolition of the death penalty in line with the global trend," the statement said, according to Ma’an. On June 22, Hamas hanged two men accused of collaborating with Israel. Two days earlier, a military court in Gaza sentenced a Palestinian Authority Arab man found guilty of the same charge to death. Describing the death penalty as cruel and inhuman, the EU said the sentences were "failing to provide deterrence to criminal behavior, and representing an unacceptable denial of human dignity and integrity," reported Ma’an. The Gaza government has said that it was using the death penalty as a means to deter PA Arabs from collaborating with Israel. 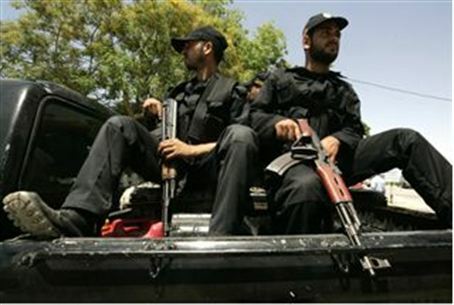 Hamas interior ministry official Salah Addin Abu Sharkh said the government had "a clear goal and several means to eradicate this dangerous epidemic," including executing convicted collaborators. Under Palestinian Authority law, collaboration with Israel, murder and drug trafficking are all punishable by death. All execution orders must be approved by the PA chairman before they can be carried out, but Hamas no longer recognizes the legitimacy of Mahmoud Abbas, whose four-year term ended in 2009. Amnesty International has called on the public to mail Gaza’s Hamas terrorist rulers in order to appeal against other executions.